Summary from Backcover: Ceony Twill arrives at the cottage of Magician Emery Thane with a broken heart. Having graduated at the top of her class from the Tagis Praff School for the Magically Inclined, Ceony is assigned an apprenticeship in paper magic despite her dreams of bespelling metal. And once she’s bonded to paper, that will be her only magic…forever. This was a good adventure to start a series. A coming-of-age plot has us begin with disappointment which we can all relate to followed immediately by discovery that disproves our ungrounded, and preconceived notions, to introduce a world of possibilities. 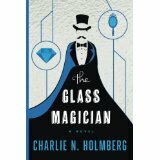 The author certainly has a vivid imagination–not only does she go deep in inventing a whole world of magic possible with paper folding, but also having a good portion of this book take place within the heart of Magician Emery Thane. What a great way to weave in backstory to set up the rest of the books. Very ingenious and instructive. I’m looking forward to book 2. Summary from Backcover: Three months after returning Magician Emery Thane’s heart to his body, Ceony Twill is well on her way to becoming a Folder. Unfortunately, not all of Ceony’s thoughts have been focused on paper magic. Though she was promised romance by a fortuity box, Ceony still hasn’t broken the teacher-student barrier with Emery, despite their growing closeness. I enjoyed the Paper Magician, but this book is even better. In book two we get more background in the other types of materials that one can “bond” to, to do magic. I thought the author’s creativity shone as she went in depth to give color with other characters and their trials with these other materials. While the plot felt somewhat contrived at times, the execution of the various plot twists, vilians and the possibility of a budding romance made the resolution very satisfying. Summary from Backcover: Throughout her studies, Ceony Twill has harbored a secret, one she’s kept from even her mentor, Emery Thane. 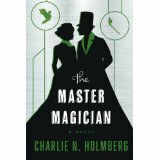 She’s discovered how to practice forms of magic other than her own—an ability long thought impossible. This sounds like a fun series for sure! It sounds kind of like Harry Potter, at least the magic part of it. I’ll be curious to hear how this author weave magic into paper. It definitely sounds creative. Previous Previous post: I’m Adding My Book Reviews to the Blog!